Bono the lead singer with Irish supergroup U2 has spoken about the bands thoughts on playing an intimate and secret Dublin concert before heading off on the world tour which starts in Miami in March. The U2 front man turned up at 11pm on Thursday night for the launch of the Beckett on film series in Dublin and told ShowBizIreland.com photographer exclusively that he was thinking about doing a secret gig in Dublin. 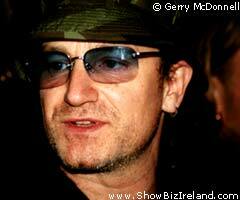 "Let's just say we're considering it," Bono said. The news comes only days before the band go back to their roots on Wednesday for a small concert in London's Astoria theatre in Charring Cross for 1,000 lucky fans. The show will be the first time the band have playing a live gig for years and is the hottest ticket it town. Stars such as George Michael and Bob Geldof are expected to attend the gig as well as a host of other well know stars. If the Dublin gig goes ahead is will most likely be in the city's Vicar Street which is owned by Harry Crosbie, Bono and The Edge's business partner in The U2 hotel The Clarence on Dublin's southside. It is also the place the band went to see Bob Dylan play for 600 lucky fans last year.